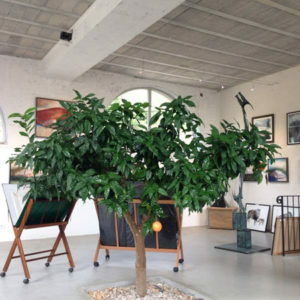 Tessa and Nigel greet you with a big smile and a nice British accent in their gallery where Tessa exhibits her works, inspired by the landscapes that surround her and her inner romance. 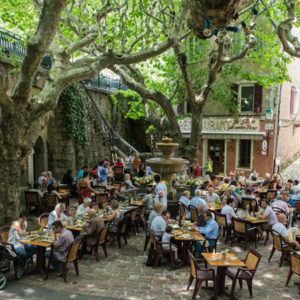 Under the centuries-old plane trees of the Place du Thouron, with its fountain and stone wash-house, Eric Brunel holds this charming restaurant, which he created at the site of his father’s old bakery. An old oil mill in a large meadow where a river flows, the Camandre, this is a nice scenery to enjoy the tasty cuisine of Philippe Choisy. During the summer in the park, or winter in the dining room of the mill, all filled with memories and history. 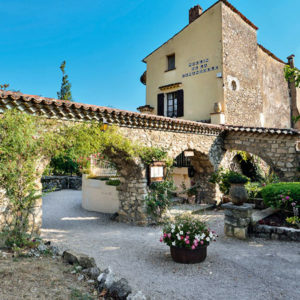 At the foot of the village of Fayence, Yves and Isabelle lead you to beautiful gastronomic discoveries in this country house surrounded by vineyards.